This is a re-read in anticipation for the film release in November. I read Catching Fire straight after I read The Hunger Games a couple of years ago so I want to get it re-read before I see the film. This got bumped way up my TBR pile after I found out that it's being released next month...I thought I had until next year! I didn't really enjoy it too much the first time around but hopefully I'll like it more after having a little Hunger Games hiatus. I know, I know; I really should have read this by now. You don't have to tell me again. :P Every time I mention Divergent it's like I've opened the gates to a flood of fangirls that will do anything to get me to read this book. It's scary. Divergent's been sitting on my bookshelf for a few months now and I keep reaching for it, reading the blurb then putting it back... I'm scared to start reading it in case it doesn't meet my expectations. :( It's really near the top of my TBR pile though. This was another review book from Curious Fox Books but, again, I haven't read it. After reading and reviewing two of their books - Diary Of A Mall Girl and Amber - I decided to take a little break and read some other stuff for a while. I guess I'm still on that break... I really like the sound of this one: it's really original. This is my most recent book purchase but it's been on my TBR list for a couple of months. I bought it in ASDA for £3.80 on Friday night when I was out with my friends (that's right, we go gallivanting round the ASDA book section at 8pm on a Friday night) and I can't wait to give it a shot. This is the most talked about book on my Twitter feed right now and everyone's raving about it, so I thought it was about time I picked it up. The Book Thief has been on my bookshelf for well over a year and it's been on my TBR list for the same amount of time. Everyone loves it and I know I will too, but the hype intimidates me... It's meant to be a really sad, profound novel so I'm waiting until I'm wanting a bit of a heavier read before I get stuck into this one. 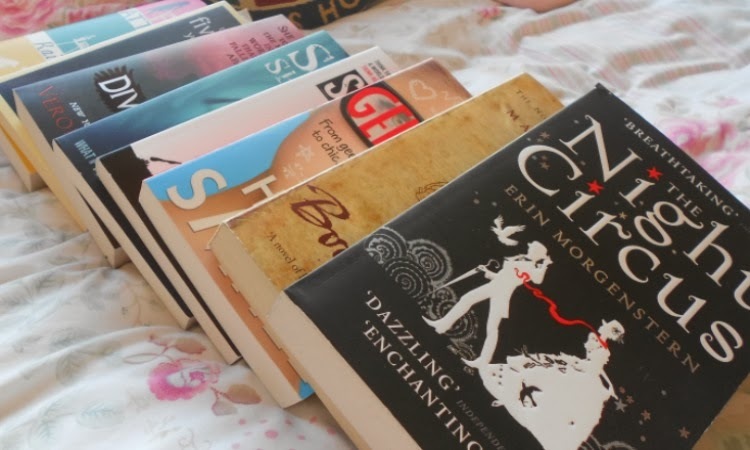 The sad thing is that I've only told you about half of my TBR pile... I didn't want this post to be too massive so I cut it off prematurely. I have one hell of a challenge if I want to get through my list. D: Wish me luck! I'm the same way that you're about Divergent when it comes to Geek Girl. I bought it in March after reading loads of positive reviews and every time I need something new to read I pick it up, think about it and put it back down again. I think it is just one of those things where you have such high expectations of a book that you don't want it to be ruined. Good luck reading all of those books!